In Hungarian, the word "takács" means "weaver," and I was struck by how appropriate that moniker was for the Takács Quartet during their recent appearance at Celebrity Series, as they essayed half (#1, 3, and 5) of Béla Bartók's six string quartets. For these pieces are themselves highly woven; they're dense with counterpoint, and their themes seem embedded in the resulting texture, almost hidden in the woof and warp of Bartók's structural ideas. Indeed, perhaps the phrase "piece of music" never rang truer than it does for certain works by Bartók: whenever a bow skitters over its strings in these quartets, or slices through a melodic line, it seems to conjure an invisible loom shifting into place - just as the famous "Bartók pizzicato" (an exceptionally lusty pluck) sometimes seems to cleave the music as cleanly as a pair of scissors. I think it's easy to forget this aspect of this particular composer, but the unassuming craftsmanship of the Takács kept pushing it to the fore. 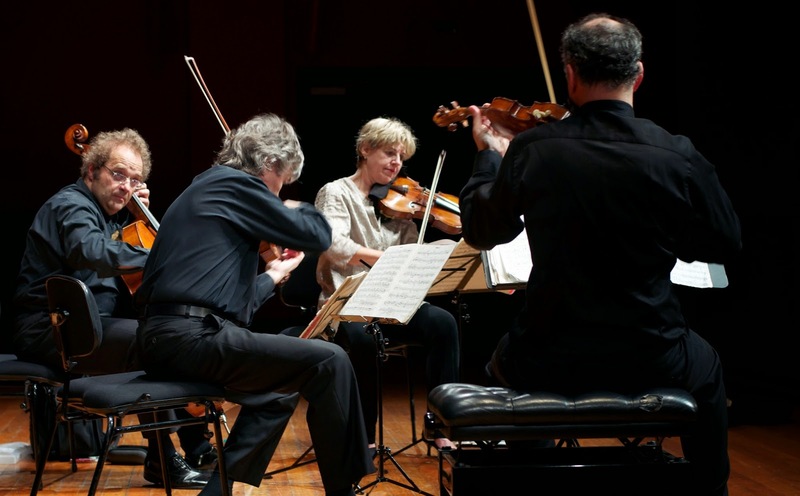 The ensemble, one of the most venerable on the concert stage, consists of Edward Dusinberre and Károly Schranz on violins, Geraldine Walther on viola, and András Fejér on cello. Schranz and Fejér have been with the group for 39 years, since its founding; in contrast, Dusinberre has been on the scene for only 21; and Walther, the most recent addition, a mere nine - which is still plenty of time to get musically acquainted. The resulting foundation of mutual familiarity and respect usually leads these musicians - perhaps unconsciously - toward balance, maturity, collegiality, and calm humility. And in a way Bartók plays to all those strengths (there's little room for solo showboating in any of his quartets). So perhaps it should have been no surprise that the Takács players seemed unfazed by this music's difficulty, or its generally anxious cadence (although there's an almost dancing energy to parts of the First, the Third and Fifth are resolutely serious, even dour). And only once did they really draw from the material (in the conclusion of the Fifth) the boisterous fire of folk song that musicologists tell us often formed its basis. Of course the Takács ensemble was always vigorous, but seemed most interested in illuminating the structure of the music - which, in the case of the Third, the shortest, most Bach-like, and most highly condensed, is quite a task in and of itself. Bartók here seems almost eager to exhaust his material as quickly as he can; we arrive at a recapitulation and finale - of initial phrases we can only just recall - before we know it. Here it felt like a dark, cleanly cut jewel. They likewise worked against the sometimes heavy melancholy of the First, which opens with a repetitively dying swoon (this is actually Bartók in late romantic mode; it was composed in 1909, when the belle époque was still belle, but the composer was suffering from the frustration of unrequited love). And I was struck by a subtle emphasis on the arch form and carefully constructed symmetries of the Fifth. To be honest, you could argue against all this thoughtful objectivity - I personally feel there's a deeper sense of incipient madness to much of the Fifth in particular; but I respected the quartet's more controlled and reasoned choices. For in the end, Bartók - even at his most inscrutable - draws much of his weird power from unresolved tensions between the sources of his art. Indeed, what a full reading of these quartets reveals is that even from the beginning, his voice was driven by conflicting emotional poles: anxiety battles it out with control, while the instinctive energy of folk song is repeatedly mastered by self-conscious structure. The end results are highly wrought, always challenging, and certainly never easy listening - a full evening of Bartók is a bit exhausting. But you leave a program of his quartets always convinced of the brilliance of this quite miraculous musical mandarin.